Must have items for Quilters! The essential tools to start quilting today or update worn tools in your sewing room. 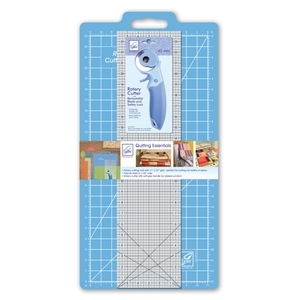 • Rotary cutting mat with 11" x 23" grid - perfect for cutting full widths of fabric. • Easy to read 6" x 24" ruler. • Rotary cutter has soft grip handle for added comfort. June Tailor JT-392 Beautiful You Clear Bra Straps, Non-slip Invisible Support, Matte finish.,Waterproof, washable & re-useable. 1 pair per package.